A few years ago my lovely English friend Kate took us to Clovelly, an exceptionally picturesque former fishing village on the Devon coast. Clinging to a cliff, its main street is cobbled and so steep that everything goes down on sledges and up on donkeys. Most buildings are wattle and daub and have heritage status, there's a Norman church, very pretty English gardens - and lots and lots of tourists, who pay a fairly hefty entrance fee to enter the village. I remember wondering what it was like to live in a village where people bought a ticket which (perhaps only by extension) gave them the right to watch and photograph your every move. Hanging out your washing, pruning your roses, rummaging foolishly through your bag for your front door key. The pace and mode of life on and around the lake seems little changed from how it must have been a century or two ago - apart from the odd satellite dish and leaning electricity pylon maybe. People paddle around their floating gardens in shallow canoes, take their produce to lakeside markets which rotate around the various settlements on a five-day-cycle, and fish using a unique leg-rowing technique which leaves their hands free to handle their nets. 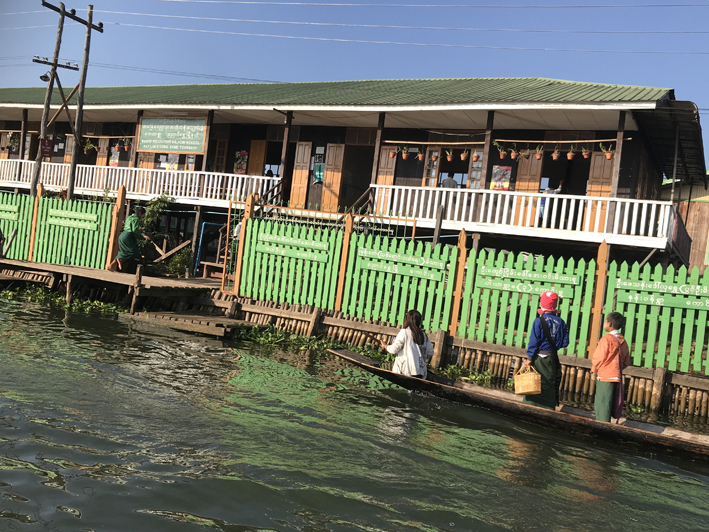 Tourist boats circle the fishermen as they cast their nets, motor slowly past women washing their hair (or their clothes) in the lake from small platforms below their houses, and drop foreigners at the produce markets where they peer and block the aisles, but buy little. And of course tourists aren't content just to watch - they must point their cameras/smartphones and photograph everything. Watching (and photographing) women doing the washing up. Oh, and look at those pretty washing lines! I admit it, I am as guilty of it as anyone else - everything is so fascinating, so different from our lives. From the children paddling themselves to school, to the kilometre-long pieces of garden being towed across the lake, to fishermen slapping the water with long bamboo poles to drive fish into their nets, to the bamboo houses on stilts, the washing drying outside. It's truly a wonderful place and as a tourist you don't want to forget anything. To be fair, I suspect many local people's lives are easier because of the tourist trade - the women who sell their beautiful hand-woven clothing and traditional silverware to the visitors, for example. Or the men who act as guides or boat drivers. Or the people working in the restaurants and hotels. Traditionally, women spin and weave cloth from lotus stems - the material they make is used for robes for senior monks or for religious ceremonies. It's a laborious process involving snapping lotus stems and pulling out the tiny fibres inside, twisting them into thread and then spinning them into thicker threat. It takes one woman a day to make 10-15 metres of lotus thread, and you need 4000 lotus stems and 20 days of work for one scarf two metres long and 25cm wide. If you wanted to donate a full set of lotus robes to a favoured monk, it will set you back US$3000. (A scarf is a snip at $45, given the work involved.) 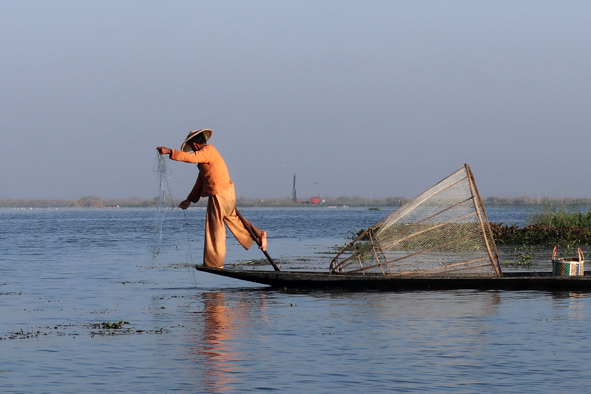 These days the "factories" supplement their lotus production by importing raw silk, cotton and polyester from Mandalay. After 50 years of serious economic mismanagement, Myanmar is a still a pretty poor country, and tourist kyats are very welcome. Moreover, like their counterparts in Clovelly, Inle Lake residents appear (from the outside at least) to have grown accustomed to the camera-in-your-face aspect of life. They look blankly through you, not malevolently at you. Still, it must be odd knowing tourists are paying to watch you live your life. And I suspect I'm not the only foreigner to feel the same slightly uncomfortable intrusive feeling I remember from Clovelly. These guys are definitely posing for tourist photos, but further down the lake, fishermen are using the traditional fishing techniques for real (see photos above). Meanwhile, as an aside, I am intrigued to calculate that tourists pay almost exactly the same to visit Clovelly and Inle Lake - the equivalent of $US9.80 for the former and $US9.90 for the latter. Could there be collusion? 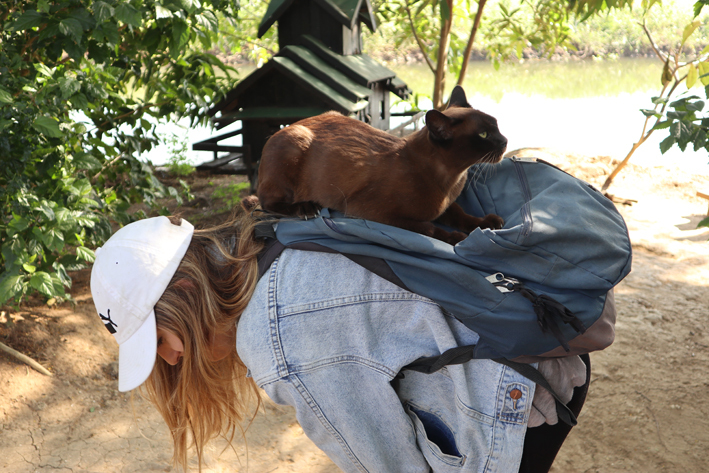 A relatively guilt-free attraction: The Inle Heritage at In Phaw Khone, where a local business woman is attempting to reintroduce full-bred Burmese cats into their native land. I mention this also as an excuse to put pictures of cats and my older children into this blog. Myanmar Independence Day - oh the excitement. Not.